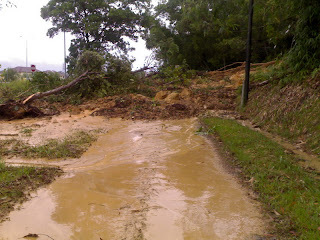 There was a landslide just outside our house at the T-junction that blocked off our road completely. I’m sure anyone passing by the main road saw it today. I was the only one at home when it happened. I got awoken by a call from my dad telling me he’s on the other side and couldn’t come in. 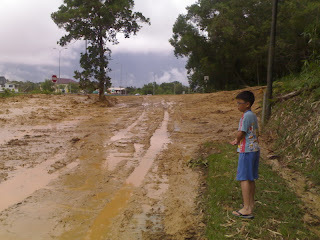 At first I thought it was just a small landslide and for a moment I even think about passing dad a shovel. How stupid my idea was when I went out of the house to have a look. It was huge. 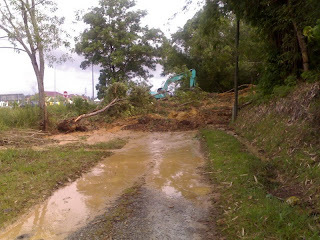 Part of the Lumut Hill collapse on our road and our telephone line got cut off. 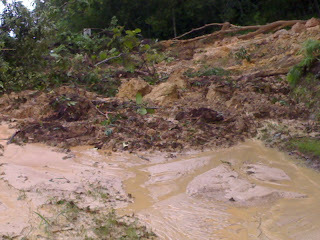 It took hours before the people managed to move the uprooted trees and mud from the area safe enough for dad to drive his car through. 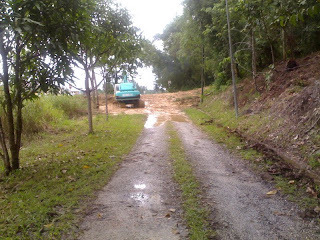 Well, it’s all cleared in the end but look just at the mess it made. Sigh. It was chaotic at home on the first day of Chinese New Year. There were lots of people – relatives, friends and strangers (at least to me). 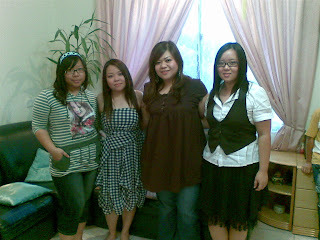 We had an open house with food catered by a friend of my mum. 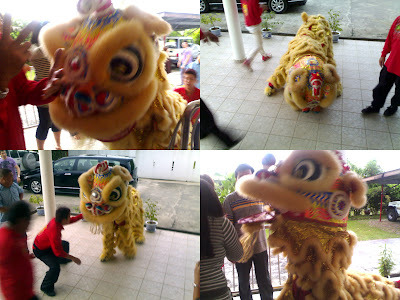 The Chung Lian lion dance troupe came also. By the end of the day, I was truly exhausted. The same can be said for the next day actually. Well, here are some pics. Btw, isn’t this cute? 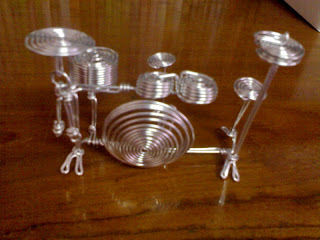 It’s a mini drum set made of one long piece of wire. It’s the time of the year again. This year Chinese New Year comes quite early but nevertheless, it’s still celebrated like how it’s celebrated each year. 2009 is the year of the ox so I’ve been seeing cows holding red packets in my dreams these days. Hmm, I wonder if I’m getting any…Guess what we’re serving this new year? You guessed it – milk! Haha…just kidding. I don’t think you would want that, do you? So wish you reader a Happy Chinese New Year. Celebrate with joy! I like this song I heard from CSI:Miami Season 6 episode 2 called 'One By One'. But unfortunately it’s hard to find the song online. But I manage to download some crappy versions from you tube. Then I stood up reluctantly and wade myself towards the board. I was supposed to do the tutorial the previous night but I watched CSI until 1 am before I realized I’ve got work to do. My brain refused to function so I let it be thinking we’re gonna just discuss the solution. So there I stood with a marker pen on the board, thinking. Really thinking. Then I stole a glance at what Nina was writing next to me. She was called too. But she scribbled and scribbled. And I started writing but I really didn’t know what I was doing. It’s embarrassing. The lecturer helped in the end. I think I took the longest time standing in front today. Ok, that makes me realize that I should take the class more seriously in the future. But right now, I have to finish watching the series first. I figure I should write something about school now that it has started. I’d say it has been a slow week because I mainly have one class per day and after that, I would find myself wandering aimlessly around campus. There’s really nothing much going on the first week of the semester. Sure I had a tutorial and a couple of lectures, but studying at this time is just ridiculous. I went to the library anyway in case I’m in luck of finding some good books to keep me occupied. And now I’ve borrowed three novels, but none of which I have any intention of reading. And since I stay at the hostel, I miss the TV at home. I really wanna watch American Idol. Is there a new judge? And Australian Open is starting soon. And I still have no idea who’s playing who. I heard about the new program structure that is going to be introduced here at uni starting next semester for the new intakes. 20 programs boil down to 4. How is that even possible? The study period for the first degree will be three years instead of four. And not to mention, there will be no more education programs being offered. It’s like a new university to me. And somehow, that makes me feel really old. I’m going to bore you with another book I read recently – as recently as earlier today. 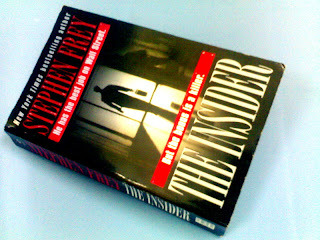 This one is called The Insider written by Stephen Frey (not to be mistaken by the comedian Stephen Fry). Initially, I got lost reading the first few pages. I never knew the world of politics and finance is so complicated. I’ve never studied business, commerce or accounting in school before so it’s really hard for me to catch up. Well, I did in the end – vaguely of course. But the core of the novel is about crime – that I know pretty well. The idea of the story is that the world revolves around money – not the sun. How scientifically incorrect and yet, it is true in many ways. In the end, since I’m not in the mood to elaborate, justice is served. Exam result came out yesterday. 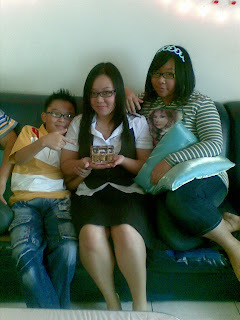 I had to wait a few more hours after the SMS result was sent to my sis phone to get the result. Well, my sis was at work, you see. And she didn’t bother forwarding the result to me. She’s very predictable. I don’t have a DST line so you see my problem. Next time I’m using my dad’s number. I said before that I had a difficult paper for the last exam and I was right. Fortunately, I passed the paper but just barely with an E. Well, who’s complaining? I should’ve failed if the paper was marked by a robot. I also didn’t do quite well in another paper but I’m sure glad I passed everything. So now I can put a closure to these worries and stash it away in a box. And then I’ll take out a new box and fill it in with new worries that are yet to come. These things just never end. I just watched this Mythbuster episode called “Hindenburg Mystery” and I’m giving it a tie with “Alcatraz Escape” as my favourite episodes from Mythbuster. Call me weird but I’m actually very fascinated by these kinds of events and the mystery surrounding them. Hindenburg is that big airship that was filled with hydrogen gas and caught fire in 1937. You can’t stop but wonder how the people felt at that time as they witness live feed of the airship going up in flames. It must be hell of a thing to watch it happened. It’s like watching history in the making. It’s pretty cool but of course, it was a total disaster. So, I recently acquired a license to build a gun. It’s an old .38 caliber and it has no bullets or trigger. It is coated with various colors in rectangular grid. It is also very light and fragile as it breaks easily. Even a baby can break it. Just squeeze it and it shatters to pieces. Consider yourself Superman. 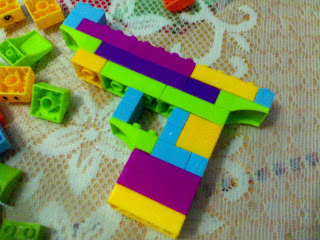 It does not fire at all so it’s okay if I point the gun at you. Well, those blocks were on the coffee table and I found two itchy hands reaching out for them. I can’t help it. I was bored. 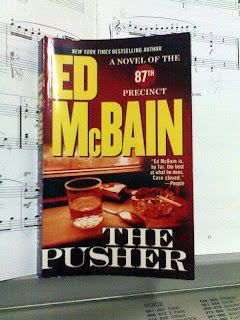 The Pusher by Ed McBain is a good old classic novel if you like reading about crime and mystery. Well, in my case, I love mystery novels. And I’ve read quite a number of the 87th Precinct series by McBain which are classic because they are old books published in the 50s and 60s. This particular book, The Pusher, is so old that my dad wasn’t even born at the time of the publication. And of course the procedure for solving the crime in this book is old school – fingerprints, footprints and stuff. No fancy equipment and DNA tests. And yet, I enjoy reading the book because it’s written by Ed, and anything by this author is good. Believe me. But only if you are a diehard fan of mystery and crime. If you are looking for romance or adventure, don’t even bother. I know I’ve said that I prefer books by British authors rather than American authors, but Ed McBain is the exception. I don’t read a lot of books but enough to set my own preferences.